They came after the evolutionists. They came after the climate scientists. They came after the public health experts. They came after the astrophysicists. They came after the stem cell researchers. So I guess it's no wonder that they are now coming after the heliocentrists. I have no idea if this Theory of Everything is even plausible, or if it is the work of crackpot. What's interesting, though is how the publicity attending this theory and its author has revealed a hunger in the news media--and, I suspect, among the general public--for a non-traditional, non-academic scientist to upend scientific tradition. This hunger has been both documented and fed by movies such as Star Trek: First Contact (a family favorite in my house). The film (which is either the best or second-best of the Trek flicks) deals primarily with the conflict between individuality and conformity, and definitely comes down on the side of the former. Along the way, though, it also touches on obedience to authority vs. doing the right thing, flawed human nature vs. mechanical perfection, obsession vs. reason, and the meaning of heroism. All of those themes are present in the case of Garrett Lisi, a 39-year-old unemployed surfer physicist, and his suggestion that the four basic forces in the universe--gravity, the strong force, the weak force and electromagnetism--and the dozens of subatomic particles that have been discovered so far fit into a beautiful 248-point mathematical pattern that looks like something produced by a super SpiroGraph. Even among the more relentlessly rational of us, there still lurks a desire for the heroic. We live in an era of huge laboratories, scientific collaboration, and hierarchical research institutions. Even so, we still pine for the Heroic Lone Scientist, someone who through his own brilliance, iconoclasm and originality will shatter old scientific assumptions. We all want the next Einstein, a guy who did his more brilliant and original work while he was a clerk in a patent office. We want to know that the individual is occasionally more powerful than the collective, that even brilliant scientists have quirks and flaws, that obsession at least occasionally leads to truth, and that sometimes credentials don't mean squat. 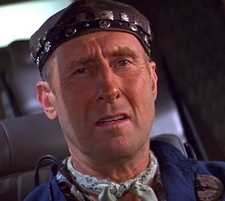 We're looking for Zefram Cochrane, a man whose scientific discoveries usher in an era of human unity, discovery and understanding. And we're looking for god, a theory that explains everything. It is these yearnings, rather than any real understanding (at least on my part, unfortunately) of the science involved that has put so much air in Garrett Lisi's sails of late. 109 days . . .
WASHINGTON (AP) — Democrat Hillary Rodham Clinton said Thursday she would sign an executive order rescinding President Bush's restrictions on federal funding for embryonic stem cell research. The presidential candidate also said she would bar political appointees from altering or removing scientific conclusions from government research without a legitimate reason for doing so. "The Bush administration has declared war on science," the New York senator said. "When I am president, scientific integrity will not be the exception it will be the rule." "For six and half years under this president, it's been open season on open inquiry," Clinton said. "By ignoring or manipulating science, the Bush administration is letting our economic competitors get an edge in the global economy. I believe we have to change course, and I know America is ready." She said Bush's limits on federal funds for embryonic stem cell research amounts to a "ban on hope." On the campaign trail, Clinton has repeatedly slammed what she calls Bush's "war on science" and accused the administration of allowing conservative political ideology to interfere with research and scientific evidence. She cites administration officials who have questioned the scientific evidence of global warming and who have suggested a link existed between abortion and breast cancer. _ Expand human and robotic space exploration and speed development of vehicles to would replace the space shuttle. _ Launch a space-based climate change initiative to combat global warming. _ Create a $50-billion strategic energy fund to research ways to boost energy efficiency and reduce reliance on fossil fuels. _ Comply with a legal requirement that the executive branch issue a national assessment on climate change every four years. She would also expand the assessment to reflect how U.S. regions and economic sectors are responding to the challenges posed by climate change. _ Name an assistant to the president for science and technology, a position that was eliminated in the Bush White House. _ Re-establish the Office of Technology Assessment. Now if only she would pledge just as vigorously to the the war on Iraq. 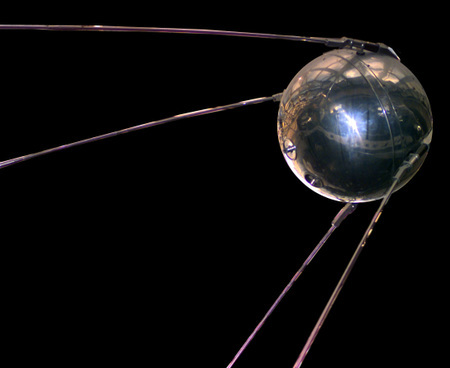 Happy 50th, Sputnik. You taught us all to dream. Some of my liberal political friends are made uneasy by huge expenditures on space exploration, particularly when there are so many unmet needs here on earth. I understand their point: space science is expensive and has had its share of boondoggles. Nevertheless, I don't agree with their conclusions. In fact, I'd be behind putting more money into NASA. Being a liberal is about more than being tolerant of differences and championing the poor and oppressed. It is a fundamentally optimistic philosophy that believes in the evolution of human beings and human society toward a more benevolent and enlightened state. It is a mindset that questions relentlessly and does not accept the status quo in the state of human society or human knowledge. To be conservative is to be essentially satisfied with the status quo and to mistrust government projects large and small; the desire to find out about stuff is a liberal quest. If conservatives had their way, we'd still believe that the earth was flat, that the sun revolved around it, and that the universe was only about six thousand years old. Oh yeah, I forgot: some people still believe that kind of thing. But the last decade's worth of frenzied efforts by the creationists and the young earthers and the geocentricists are evidence that enlightenment is advancing. There is an inherent conflict in using 21st century technology to propagate a 13th century world view, a conflict that is bound to become more and more apparent as the state of our scientific and technical knowledge advances. The telescope will capture images of what the universe looked like just 400 million years after the Big Bang. "We're trying to see, what were the conditions like back then," Stockman says. 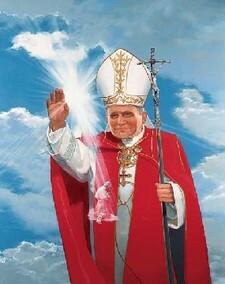 "How was it that it chose to form into the stars and galaxies and planets that we have today? It's a curiosity and a fascination, and our lives, in a large sense, were affected by what went on then." Conservatives don't share that restless curiosity and fascination. The things we might learn as a result scare them. 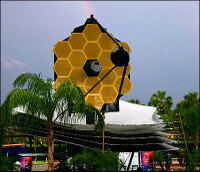 They look at the Webb telescope (a full-scale model of which is pictured here with incongruous palm trees in the foreground) and see something that really IS a ray gun, a weapon pointed at their belief systems. And so some of them develop a sudden and patently insincere urge to spend public moneys on social welfare projects instead of science and space exploration. This line is superficially appealing to some of my progressive buddies, who wonder why we can find money for the Webb but not money for feeding the hungry. Note the word "superficially": a deeper understanding of liberalism mandates support for projects like this.